Twin brothers Jeffrey and Jason Linford, owners of the pest control firm Hollywood Bug Guys, have made a name for themselves in pest management and in entertainment. The 34-year-old Arizonans were introduced to pest control while in college, working as door-to-door sales professionals for Bulwark Exterminating in 2004. In 2010, they launched Green Worx Pest Control, the forerunner to their current business, The Hollywood Bug Guys. The company serves the East Valley area of Phoenix. For their Gong Show appearance, the Linford brothers fiddled to the tune of Britney Spears’ “Toxic” as dancing, costumed cockroaches closed in on them. Although the duo did not win, they scored well with the judges and did not get the dreaded gong! The Linfords said future plans include continuing this marriage of pest control and entertainment. Specifically, they have been pitching themselves to those in Hollywood such as producers, casting directors and production companies with the hopes of becoming reality TV stars. Visit Jeffrey and Jason Linford at the Mattress Safe booth (#927). While you are there, learn more about Mattress Safe and its state-of-the-art mattress encasement options, designed to fit any mattress. Pi Chi Omega, the pest control industry’s national fraternity, will be exhibiting at NPMA PestWorld (booth #1139). For those who are not members, stop by the booth and learn what the organization is all about. Pi Chi Omega is sponsoring an educational session by Bennet Jordan, Ph.D., BCE from Copesan Pest Solutions. He will be speaking on the topic “Where Science and Service Meet: Developing Solutions for Stored Product Pest Complaints,” on Thursday at 4:30 p.m.
BASF (booth #616) announced the release of Fendona CS controlled release insecticide, a broadly effective new perimeter pest solution that the manufacturer says produces faster results and fewer callbacks. BASF says Fendona CS is the result of a real breakthrough in research and technology and the product is specifically designed to help pest management professionals (PMPs) beat tough-to-control spiders, scorpions and mosquitoes, as well as everyday perimeter pests like ants and beetles, and occasional invaders like earwigs and pillbugs. Labeled for more than 60 pests and a wide range of interior and exterior surfaces, BASF reports that new Fendona CS insecticide outperformed competitive products in trials, reducing callback rates, lowering labor and material costs, and increasing the satisfaction of customers and PMPs alike. Two innovations, BASF reports, differentiate Fendona CS insecticide: a purified active ingredient called alpha-cypermethrin that’s four times more active than regular cypermethrin, and an advanced encapsulation technology that produces smaller and many more capsules, and facilitates diffusion of the active ingredient from inside the capsule into the lipophilic cuticles of arthropod pests. The Professional Pest Management business of Bayer (booth #1216), within the company’s Environmental Science Unit announced an updated label for Temprid. Temprid FX is the co-milled, dual-active combination product that provides continued control of hard-to-kill pests, the manufacturer says. Its expanded label adds flexibility to outdoor perimeter applications including foliar applications, as well as additional use patterns for combating public health pests. Bell Laboratories (booth #417) announced that its Contrac rodenticide is now available in a soft bait form. Contrac Soft Bait is Bell Laboratories’ most extensively researched and tested rodenticide ever, the company reports. Throughout the product development process, comprehensive field testing was conducted in both urban and rural areas, as well as commercial and residential settings. 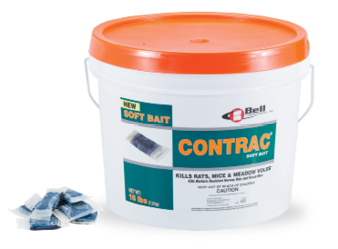 Along with outstanding rodent acceptance and control, Bell’s Contrac Soft Bait comes with an extensive list of key attributes. The Soft Bait has a unique oil-based formulation with a precise balance between saturated and unsaturated fats. In addition, the manufacturing process ensures maximum contact of the paper sachet to the soft bait—further maximizing bait acceptance. The Soft Bait is also designed to withstand almost any climate. In cold climates, the bait won’t freeze and when temperatures and humidity rise, Contrac Soft Bait is both mold- and heat-resistant. Diversified Sales & Marketing (booth #705) is a company that represents the following manufacturers to the pest control industry: Diversified Plastics Industries; CCJ/LLC Green Drain Products; Noble Pine Products; Susan McKnight; and Mattress Safe. Product lines include: E-Z Access II and cover-up bath trap panels; E-Z Access crawlspace doors and insulated crawlspace doors; Mini-Port access covers; Sterifab insecticide and disinfectant/sanitizer; Green Drain floor drain trap seal; Climb-Up insect monitors and traps; and Mattress Safe mattress and box spring encasements/covers and bed bug suits. Visit booth #705 and visit www.divsales.com. Slingshot (booth #430) says it “is on a mission to bring the pest control customer experience into the 21st century.” The software provider uses a combination of in-house services and software tools to help pest control brands all over the U.S. provide the speed, interactivity, and 24/7 availability that modern customers demand. From after-hours call answering and live webchats to online ordering and integrated business intelligence, Slingshot is building a powerful customer engagement platform, the software provider reports. Slingshot offers tools to help PMPs engage leads, enhance close rates and more, the company says. Visit Syngenta at booth #1227 to learn about the company’s newest cockroach control solutions — Advion Evolution and Optigard Cockroach Gel Baits. These products offer PMPs advanced cockroach control with enhanced bait matrices and differentiated active ingredients (a.i.). Advion Evolution features the performance of indoxacarb, the same a.i. found in Advion Cockroach Bait Gel. It offers an enhanced bait matrix that is highly attractive to cockroaches, which results in increased feeding in even the toughest-to-control accounts, Syngenta reports. Optigard Cockroach features a unique a.i., emamectin benzoate, which affects cockroaches at two different target sites. This helps provide another tool to control cockroaches, all while following good resistance management practices, Syngenta said. The Professional Women in Pest Management (PWIPM) wants attendees to “B’Fit” during PestWorld by taking at least 50,000 steps during the conference. Show your step counts at the NPMA Booth to receive a prize. Have a FitBit? Join the PestSteps group online at https://www.fitbit.com/group/22T7GY. If you don’t have a FitBit, use any step tracking device, download a pedometer app on your phone, or purchase a pedometer for $5 at the NPMA booth. Proceeds go to the Avon Foundation for Women. The B’Fit PestSteps Challenge is sponsored by PestWest and ServicePro.